Top 10 Climbing Destinations in the U.S. The United States is the birthplace of modern rock climbing, and this shouldn’t be a surprise to anyone because the U.S. offers a considerable variation of stunning rock climbing destinations. If you’re a climber, there are few countries better to live in, or visit, than the United States. A climber could spend years traveling across the U.S. and still never rope-up in all the fantastic destinations. Between big granite walls, sandstone towers, and limestone caves, there are options to please all types of climbers. If you’re looking to explore the U.S. and appreciate its many natural habitats, consider climbing your way across the country. Can anywhere really compare to this incredible destination? The birthplace of modern rock climbing, at Yosemite you can traverse the same mountains as many great climbers that have come before you. Here, you’ll find beautiful granite trad climbs as far as your eyes can see. That being said, the only significant drawback is that Yosemite has become popular and crowded; expect to fight crowds if you’re trying to get on a classic route during peak climbing season. Even if you’ve never heard of Smith Rock, you’ve probably seen pictures of it. An excellent destination for climbers that are capable of moderate and challenging routes, Smith Rock tops out into an incredibly picturesque scene. If you strategically place a friend with a camera, you’ll capture a photo worthy of outdoor retail ads. If you’re looking to climb long-aided routes on sandstone, Zion is a great destination. 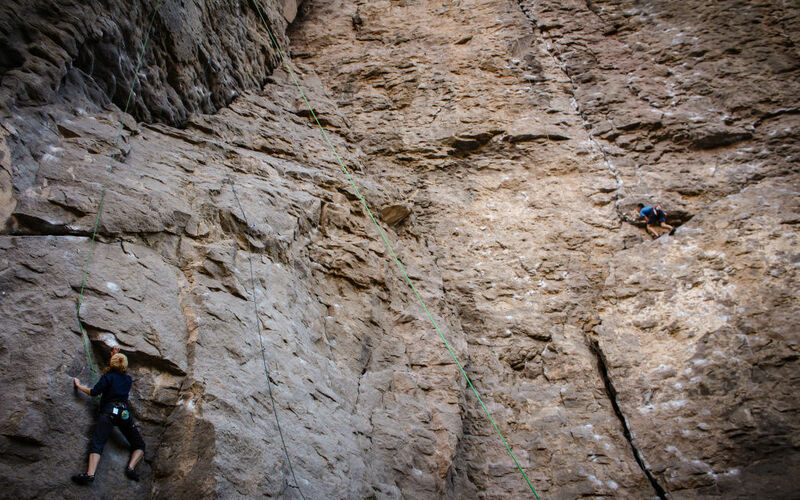 There’s not much trad climbing in Zion, and absolutely no sport climbing, so it is reserved for aide climbers. However, there are some easier or moderate aided routes, and if you’re looking to do an overnight bivy for the first time, this could be the perfect place. People generally think of the West Coast when they’re thinking of climbing destination. However, the Gunks (short for Shawangunks) is a premier destination, and it’s located just 85 miles away from NYC. There are no sport climbs in the Gunks, so keep that in mind when planning your trip, but trad climbing opportunities are ranging from easy 5.4s to difficult 5.12s. The Gunks is one of the oldest climbing locations in the country, and some of these classic routes were put up in the 1940’s, so careful not to get sandbagged when picking out a climb. Perhaps it had its hay-day in the 90’s, and to some extent, it’s been overshadowed by areas like Yosemite, but City of Rocks is a still a phenomenal location for those of us interested in climbing great granite lines. There are a few longer routes in City of Rocks, but most climbs are under 3 pitches. While it’s not for the faint of heart, Rocky Mountain National Park is one of the most beautiful places to climb in the U.S. That being said. The climbs take a lot of commitment. Rocky Mountain climbs generally take place in an “alpine setting,” meaning that you have to be prepared for long days of tough climbing. More so than other parks, you have to be prepared to hike long approaches and read the landscape for potential hazards. Not far from Bishop, this destination is a mecca for sport climbers. The Gorge can get crowded, but if you’re willing to hike farther in you can escape the worst of it. You can take a seat anywhere in the gorge and see dozens of sport climbs literally. There are thousands of routes in this world-renown destination, and the area is perhaps best known for its bouldering problems. The summers can get hot, but most of the year Joshua Tree makes for a great climbing destination. The rock itself is quartz, and the desert varnish allows for some friction moves. One of the best sport-climbing destinations in the world, this crag is named after the quiet little town it sits above. The rock is all schist, which makes for an interesting “wood” like feel due to the “grain” that forms in the rock. If you’re on the east coast, don’t skip out on Rumney. A great sandstone mecca, Red Rock has a variety of long multi-pitch trad climbs as well as short sport climbs. It gets brutally hot in the summer, and cold/windy in the winter, but for half of the year the weather is pleasant. Red Rock has exploded in popularity in recent years, so expect long waits at the base of any classic climbs. Despite the crowds, Red Rock is still a world-class climbing destination, especially if you like desert climbing. We hope that you consider traveling to a few of the locations that we’ve listed as our “Top 10 Climbing Destinations”. But remember, these locations only scratch the surface of what the U.S. has to offer. There are plenty of great climbing crags that are hidden gems, little known to outsiders, for you to hunt down and find across the country. Plus, there are plenty of unclimbed crags and multi-pitch routes, waiting for a climber like you to discover them.